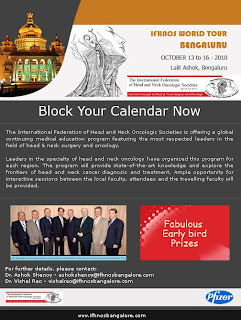 The International Federation of Head and Neck Oncologic Societies is offering a global continuing medical education program featuring the most respected leaders in the field of head & neck surgery and oncology. This global CME under the dynamic leadership of President Dr. Jatin P. Shah (Chairman, Head & Neck Service, Memorial Sloan Kettering Cancer Centre, New York) has taken upon itself the herculean task of disseminating to every corner of our planet, the most fundamental and accepted concepts that should dictate the optimal care of patients with Head and Neck cancer. Six outstanding leaders in the field from various nations will undertake a historic International tour for the purpose. We in Bangalore have the pleasure and privilege of hosting the event for India and for our neighboring South Asian countries viz. Nepal, Bangladesh, Bangkok, Pakistan and Sri Lanka. The IFHNOS theme entails a complete overview of current trends and advancements in the field of Head and Neck Oncology. The conference is multidisciplinary and is targeted at Head and Neck Oncologists, Surgical oncologists, Radiation Oncologists, Medical Oncologists, Otolaryngologists, General Surgeons, and others with a special interest in the field of Head & Neck surgery. Leaders in the specialty of head and neck oncology have organized this program for each region. The program will provide state-of-the-art knowledge and explore the frontiers of head and neck cancer diagnosis and treatment. Ample opportunity for interactive sessions between the local faculty, attendees and the travelling faculty will be provided. On the eve of this global scientific meet we encourage maximum participation from all clinicians & institutions to derive utmost benefit from the scientific feast and uplift the standards of care for head neck oncology. We have made special arrangements for this upcoming event which includes early bird discounts on all registrations and accommodations as well as special offers on travel. All details pertaining to the registration, accommodation and travel are available at the website www.ifhnosbangalore.com . Please register at the earliest to avail the early bird offers. We look forward to welcoming you in Bangalore. If you have any additional queries please feel free to contact the organizers.